A couple of really interesting articles on disaster response over the course of the last few years. The June 2 issue of Time Magazine gives "Roused by Disaster" about the response of the Chinese government to the disastrous earthquake of May 12. It's a fascinating read that describes a response much greater and more human that might have been expected. From the Time issue one week later, "How to Survive a Disaster" describes the steps that can be taken by an average citizen in cases of calamity... with special mention of the Morgan Stanley Security Director Rick Rescorla who saves scores of lives in one of the Towers on 9/11. Finally, if you go back to an August 2007 issue of BusinessWeek, there's "If the Levees Fail In California" about the potential for disaster in the Sacramento Delta region of California. Thinking about these stories, they come at the topic from different angles... one is the response of an entire government to tragedy, one is what a government could do in cases of disaster and one features near superhuman individual response. I guess the point is that in cases of need, both the government and average citizens need to rise to the occasion. Something that didn't happen enough on either side in the aftermath of Hurricane Katrina, but... you gotta hope for the future. Very interesting cover story in the August 2008 issues of BusinessWeek titled Beyond Blogs. This is actually a follow up piece to a BW story done in 2005, blogs will change your business. Blogging is an interesting thing. It can in cases like The Huffington Post develop into an actual news source and in other cases can be simply the stereotypical "guy in his basement". What's important for those who do spend time blogging, it has to be interesting to do. From there, some may achieve fame and fortune, but most will simply spend some free time doing something they find interesting (hopefully). Similar to Bill Bryson in his whimsical and entertaining books "In a Sunburned Country" & "A Walk in the Woods" among other travel tales, Eric Weiner delivers in "The Geography of Bliss" an excellent global search for happiness detailing the relative moods of people in places as far flung as Iceland, Moldovia and Quatar. Weiner seemlessly mixes together humor with the descriptions of each place and comes to the conclusion that one of the biggest drivers of happiness is a common culture... as held by the people in Iceland and not to be found at all in Quatar. Interesting stuff, and very entertaining. There's a fairly huge topic in business/society/the world today that demands attention... energy and the environment. Each could of course be treated as a separate topic with umpteen numbers of subtopics (all important), but for the purpose of this post, I'd like to bring them together and look at some of the articles I've noticed lately in this area. To start off, there's a baseline distinction to keep in mind when considering energy... public (i.e. government) vs private (i.e. you and I and the companies that we live and work around. Public action: Not much confidence that anything will happen there, especially with the current administration. To this point, there's a June 2008 essay in Time Magazine titled "The Oil Follies? Our Fault" that speaks to the lost opportunity following Sept 11 when President Bush could have likely invoked with public acceptance a significant gasoline tax. Benefits of this from the public side would have been bringing money into the coffers (at a minimum for fighting terrorism and perhaps even funding alternative energy research). On the private side, this increase in gasoline costs would likely have caused consumers to reduce gasoline consumption (as they're doing right now, some 7 years later). This idea and the positive benefits from it are detailed in "10 Things You Can Like About $4 Gas" from the July 14 2008 issue of Time. On the corporate sector private side, consumer demand for reduced energy would have sped up the process (as in happening now) of developing alternative sources of energy to replace the rapidly depleting and environmentally harmful current forms (i.e. oil & coal). There's a large number of examples of this corporate private sector movement towards energy and the environment. They range from pure energy development to environmentally sound actions apart from energy itself. A couple of examples of energy development can be found first in the Oct 15 2007 issue of BusinessWeek which features a story titled "Solar's Day In the Sun" on Silicon Valley startup Ausra Inc and second in the July/August issue issue of Fast Company Magazine... in which investor Vinod Khosla, "The King of Green Investing", is profiled. If you're looking for stories of companies focusing on environmental efforts rather than pure alternative energy development, examples abound there as well. In Sept 2007, Fast Company profiled former Sierra Club wunderkind president Adam Werbach and his environmental consultations with Wal-Mart titled "Working with the Enemy." More recently, BusinessWeek in it's June 30 2008 issue published "I Have Just One Word for You: Bioplastics" about biogradable plastics and Time gave us "Pick Up a Mop" in it's July 14 edition about the idea of, and science around, soaking up already emitted carbon dioxide. So, energy and the environment... huge topics both that are getting a lot of attention both separately and together. I stated earlier agreement with the Time piece arguing President Bush should have taken steps around energy in the form of a gas tax after 9/11, but he didn't, so the question becomes 'is it too late for optimism?'. In an excellent commentary (which I would love to link here, but can't find) contained in one of his 2008 Esquire Magazine "Editor's Letters", David Granger gives his optimistic view of future energy given the new technologies coming about . Additionally, I echo the sentiments in the "Things to Like About $4 Gas" piece around consumer demand making a difference. Finally, there's the hope (which may be fools hope, but we gotta take what we can at times) of changes stemming from a new administration in the White House. When you come down to it, there's opportunity to make things better and I'm guardedly optimistic (and very hopeful) we'll embrace that on all fronts... public and private. In her book "The Devil's Teeth", published in hardcover back in 2005 and then paperback a year later, Susan Casey gives a fascinating account of her time spent on and around the Farallon Islands 27 miles out of San Francisco and home to a thriving seasonal population of great white sharks. Very interesting read and highly recommended for anyone who likes a true adventure yarn... particularly someone in the Bay Area who may have flown over the Farallones at one point or another. I was not familiar with Casey's writing prior to reading the book and didn't come across her name again until coming across in the May 2008 issue of Esquire a profile of 75 year old workout fanatic and extreme thrill seeker Don Wildman appropriately titled "The World's Healthiest 75 Year Old Man". The story was interesting given both the crazy regimen followed by Wildman and his celebrity-athlete workout partners (including surfer Laird Hamilton and hockey player Chris Chelios), but Casey's solid writing added to the effect. Was interesting to recognize the name and then realize that she had also been behind the book on the Farallones. Most sports fans have likely heard about the youth movement sweeping the front offices of Major League Baseball... exemplified by the cherubic Theo Epstein taking the GM post (and now two World Series titles) in Boston. The July/August 2008 issue of Fast Company Magazine profiles yet another of these whiz kids, GM Jon Daniels of the Texas Rangers in it's piece "Li'l Slugger." If this piece doesn't provide enough envy fodder, the following should do the trick. In the Feb 2007 issue of Esquire, Chris Jones (my favorite current writer) writes "Into the Void", a profile of the Minnesota Wild Director of Hockey Operations, Chris Snow, who who moved to that post at age 25 after serving as a sportswriter for the Boston Globe. Yep, from sportswriter to NHL executive at 25... pretty solid career transition. Lots of interesting stuff going on at Ye Ol' Peanut Factory. Below is a listing (not complete nor exhaustive, but simply articles I've come across) of things taking place at my place of gainful employment. No, none of this is particularly "insiderish" as this list could have been compiled by pretty much any trained monkey, but I did find all of these articles of note. The Aug 2007 BusinessWeek listing of the "Best Global Brands" had HP at #12 in the list, but also included mention of HP as a turnaround brand due in part to the "Computer is Personal Again" spots. BusinessWeek in Sept 2007 did review of HP's efforts in smartphones. Also from Sept 2007, there was a very interesting profile of the Microsoft HR head and the people management (aimed at employee happiness & retention) done at the corporation. This article was of course not HP related, but it's always interesting to see what type of things other big companies do. In Oct 2007, Fast Company Magazine had a profile of HP VP Design Sam Lucente and his impact on and role in the company. Lucente is considered in part an ethnographer and launched a research project following the lives of families in their homes – result was his design team creating “Q control” for use across HP product lines. Having met with him, I can also say he's a heck of a nice guy. In the Nov 2007 "Inside Innovation" section of BusinessWeek was a piece on the HP Innovation Office led by Phil McKinney with specific mention of the efforts around the VooDoo PC. The Feb 2008 issue of Fast Company Magazine had a feature titled "Loco Motion" about advertising agency Motion Theory and the spots it has created for HP among other companies. In April 2008, BusinessWeek looked at HP Labs and it's initiative to focus on major projects. From July 2008, the San Jose Mercury News published an interview with the aforementioned HP PSG CTO Phil McKinney & Innovation Program Office head. McKinney has been pretty visible lately both outside (as evidenced by this interview) and inside (I recently heard him do a talk where he discussed his open to the public blog) the company. The June 2008 issue of Fast Company Magazine contains a very insightful special report titles "China Invades Africa" on the ongoing Private/Public efforts of China to stake claim to needed resources (both now and in the future) that are and will be taken out of the continent of Africa. There's several interesting things about this report... one is the Chinese government backing of private enterprise in this effort and a second is the long-term view being taken to look at what resources will be needed as the population expands. In the May 2008 issue of Esquire Magazine, writer at large Chris Jones contributes "The Things That Carried Him" about fallen serviceman Sgt. Joe Montgomery. It's an amazingly poignant piece about the path currently taken from the time of death in Iraq to burial in the U.S.
Jones has been writing for Esquire for some time now and at http://www.esquire.com/ additional stories can be found. 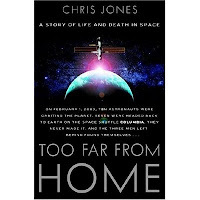 Also, he has the book "Out of Orbit: The Incredible True Story of Three Astronauts Who Were Hundreds of Miles Above Earth When They Lost Their Ride Home" currently available in paperback... previously was titled "Too Far From Home" in the hardcover edition. Regardless of what it's called, it's an excellent book that presents an extremely human portrait of the US astronauts and Russian cosmonauts who were at the International Space Station at the time of the Shuttle Columbia disaster.